Garmin International Inc., a unit of Garmin Ltd. (NASDAQ:GRMN) , today unveiled Garmin Vantage, a family of existing Automatic Dependent Surveillance-Broadcast (ADS-B) solutions designed to exceed the needs of aircraft owners and operators around the world. These ADS-B solutions serve a diverse number of aircraft and their operators, including experimental, general aviation, helicopter, business and transport category aircraft. Garmin Vantage encompasses the industry’s most comprehensive line of ADS-B solutions that are presently available to address air traffic modernization initiatives around the world, while offering safety enhancements to aircraft owners. For aircraft without modern display technologies, the GDL(R) 84 presents many aircraft owners with a cost-effective solution to meet NextGen requirements without the need to overhaul the panel of the aircraft. 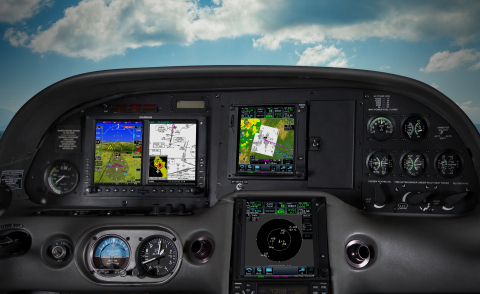 The GDL 84 offers experimental and general aviation aircraft an all-inclusive option to wirelessly display weather and traffic on a mobile device, while meeting regulatory requirements for ADS-B Out when operating below 18,000 feet. Additionally, for aircraft owners who do not already have a compatible WAAS GPS position source on board their aircraft, the GDL 84 offers a built-in WAAS GPS receiver. The GDL 88 goes one step further to provide the benefits of ADS-B on a compatible display installed in the panel. These Garmin Vantage ADS-B solutions are approved for hundreds of aircraft makes and models and provide pilots operating in the U.S. with a simple, straightforward option to meet airspace requirements. Thousands of customers already equipped with Garmin avionics in their panel are provided an easy upgrade path to meet ADS-B airspace requirements around the globe, thanks to our heritage of scalable and upgradable product designs. Aircraft owners who already have a GTX 330 or GTX 33 transponder can optionally pursue a simple Extended Squitter (ES) upgrade for $1,200* (plus installation). When paired with a compatible WAAS position source, this quick and easy upgrade provides the transponder with the appropriate transmission capabilities to meet ADS-B Out requirements. For GNS non-WAAS customers, a path is available to upgrade existing avionics to WAAS for use as an approved ADS-B Out position source. The GDL 84H and GDL 88H provide a rule-compliant ADS-B Out solution for helicopter operators in the U.S., while offering state-of-the-art traffic alerting capabilities tailored to these operators and their unique operations. As part of Garmin’s Terminal Safety Solutions, TerminalTrafficTM provides pilots with the most comprehensive picture of ADS-B-equipped aircraft and ground vehicles in the airport environment. ADS-B-equipped aircraft in-flight are easily distinguished from ground vehicles and taxiing aircraft, which are displayed using distinct colors and symbols. Additionally, while operating in the airport environment, nuisance alerts from fixed-wing aircraft are minimized and abbreviated while performing unique helicopter maneuvers such as hovering. On Scene mode also works in the background to minimize nuisance traffic alerts when intentionally operating in close proximity to other helicopters during hovering operations such as Electronic News Gathering. On Scene mode is available with the GTNTM 650/750 touchscreen avionics and GDL 88H. As part of Garmin’s expansive ADS-B portfolio, the GTX 3000 meets current compliance standards as a certified ADS-B Out solution when paired with a WAAS position source such as the GDL 88, allowing this cohesive system to meet ADS-B requirements for a variety of business and transport category aircraft. With this Vantage solution, owners and operators can satisfy global ADS-B requirements and receive the benefits of ADS-B without the need to pursue costly Flight Management Systems (FMS) or cockpit display upgrades. Utilizing the internal WAAS/SBAS receiver within the GDL 88, the GTX 3000 transponder broadcasts aircraft identity, state and intent data (DO-260B compliant) to air traffic control, while integrating with existing equipment such as TCAS systems and transponder controllers. This Vantage ADS-B solution is currently certified for the Gulfstream G150 and G200 business aircraft and is available at the Gulfstream Service Center in Dallas, Texas. Garmin Vantage ADS-B solutions are further extended to experimental amateur-built and light sport aircraft (LSA). Pilots who install the non-certified G3XTM and G3X Touch systems can become ADS-B Out compliant with the remote-mounted GTX 23 ES transponder, when paired with an approved WAAS position source, such as a GTN touchscreen navigator. Transponder control is provided on the display of G3X and G3X Touch, giving pilots convenient access to this remotely installed solution. Dual-link technology offered by the GDL 84 and GDL 88, provides pilots with the most comprehensive traffic picture available in the industry today as these solutions receive on both approved ADS-B frequencies. Enhancing the traffic picture, TargetTrendTM offers pilots a heightened state of situational awareness. Traffic trajectories and potential conflicts are easier to identify with TargetTrend, which incorporates relative motion technology to help pilots visualize closure rate of nearby traffic targets. The traffic picture is further enhanced during taxi, takeoff and landing with TerminalTraffic, which detects and displays other aircraft or ground vehicles on runways or taxiways who are also broadcasting their ADS-B position information. All of this information is presented to the pilot on a simple, easy to understand SafeTaxi(R) diagram with reference to runways, taxiways hangar locations and more. Flight Information Service-Broadcast (FIS-B) weather products are another example of the many benefits offered by receiving ADS-B In. Select Garmin Vantage ADS-B solutions take advantage of subscription-free weather, including NEXRAD imagery, METARs, TAFs, winds and temperatures aloft, PIREPs, NOTAMs and more within the U.S. These weather products are accessible on a variety of certified displays and mobile devices, offering pilots a number of possibilities when it comes to receiving the benefits of weather and traffic in the cockpit. Garmin Vantage is backed by decades of experience resulting in superior integration, industry leading technology and exclusive features unmatched by any other ADS-B solution available on the market. Aircraft owners can discover which Garmin Vantage solution best suits their needs by visiting our newly redesigned ADS-B website, which provides owners with the tools needed to make informed decisions regarding their individual installations. Garmin’s new website guides pilots through a series of graphics, videos and also features an interactive installation planner to suggest a Garmin Vantage solution tailored to their individual aircraft and operations. For a limited time, the installation planner concludes by supplying a $200 discount certificate good toward the purchase of select Garmin Vantage ADS-B solutions. Visit our updated website at: www.garmin.com/ads-b. Additionally, Garmin plans to conduct a series of online ADS-B webinars for customers. The first webinar will be hosted on March 18, 2015 at 7:00 PM CDT. These webinars will discuss the technicalities surrounding ADS-B, address commonly asked questions and highlight a variety of Garmin Vantage ADS-B solutions that can help aircraft owners receive added safety benefits while satisfying global ADS-B requirements. To register for one of Garmin’s webinars or to attend a regional ADS-B seminar conducted by a Garmin aviation regional sales manager, visit: http://www.garmin.com/us/products/intheair/seminars. For more than 25 years, Garmin has pioneered new GPS navigation and wireless devices and applications that are designed for people who live an active lifestyle. Garmin serves five primary business units, including automotive, aviation, fitness, marine, and outdoor recreation. For more information, visit Garmin’s virtual pressroom at garmin.com/newsroom, contact the Media Relations department at 913-397-8200, or follow us at facebook.com/garmin, twitter.com/garmin or youtube.com/garmin. Garmin International Inc. is a subsidiary of Garmin Ltd. (Nasdaq: GRMN). Garmin Ltd. is incorporated in Switzerland, and its principal subsidiaries are located in the United States, Taiwan and the United Kingdom. Garmin, SafeTaxi GDL are registered trademarks and TargetTrend, TerminalTraffic, GTN and G3X are trademark of Garmin Ltd. or its subsidiaries.